The girls at St Clare’s know that school life is what you make it. But as well as deep friendships and rivalries, boarding at St Clare’s has lots of surprises in store! 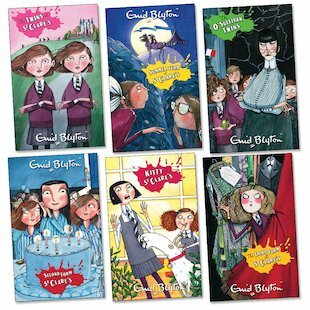 These classic stories from Enid Blyton’s best-loved school follow twins Pat and Isabel O’Sullivan as they progress from the first form to the fifth form. Spoiled and vain to begin with, the twins soon see that they must lose some of their pride to make headway at the school. Amid a colourful cast of characters – including playful Bobby, wild Claudine and circus girl Carlotta – there’s no shortage of friends to make, adventures to have and scrapes to get into! I’ve read two of them in my primary school and then forgot about them and now I want to read the rest!